The wise folk at the Competitive Enterprise Institute have become vexed by all this talk about global warming and climate chaos - setting aside their cigars and revitalsing radium drinks, putting down the bottle of DDT they were washing the kids' hair with, shuffling past the piles of asbestos in the back yard and hunting through the garage to get some video gear from behind the old X-Ray machine they use to check everything inside is OK once a week, they have produced some unusual advertisements to explain why the world's scientists have got it all wrong about the danger of constantly increasing the amount of carbon dioxide in the atmosphere. A little girl blows away dandelion fluff as an announcer says, "Carbon dioxide: they call it pollution; we call it life," in an advertisement targeting global warming "alarmists," especially Al Gore. The television ads, screened for the press on Wednesday and set to air in 14 U.S. cities starting on Thursday, are part of a campaign by the Competitive Enterprise Institute to counter a media spotlight on threats posed by worldwide climate change. The spots are timed to precede next week's theatrical release of "An Inconvenient Truth," a documentary film on global warming that features Gore, the former vice president and Democratic presidential candidate. Against backdrops of a park, a beach and a forest, one celebrates the benefits of greenhouse gas-producing fuels. "The fuels that produce CO2 (carbon dioxide) have freed us from a world of back-breaking labor, lighting up our lives, allowing us to create and move the things we need, the people we love," the ad runs. "Now some politicians want to label carbon dioxide a pollutant. Imagine if they succeed — what would our lives be like then?" The other ad questions media reports of the threat of climate change, especially a Time magazine issue devoted to the topic, and shows film of a glacier melting and then runs in reverse to show the glacier reconstituting itself. "They fly in the face of most of the science," Charlie Miller of Environmental Defense said of the institute ads. "The good news is that there's not a trade-off here between prosperity, jobs, growth and protecting the Earth. We can do both." I'm sure its just a coincidence that oil companies are the major donors to the CEI - they are, after all, idealistic searchers for the truth (regardless of how inconvenient the truth may be), not mere propagandists for toxic industries past their use by date. Think Progress takes a look at the funding sources for this educational outreach effort and their phobia of "dark-ages thinking". The Competitive Enterprise Institute, which widely publicizes its belief that the earth is not warming cataclysmically because of the burning of coal and oil, says Exxon Mobil Corp. is a “major donor” largely as a result of its effort to push that position. CEI also gets funding from other oil companies through the American Petroleum Institute. Exxon documents reveal the company gave $270,000 to CEI in 2004 alone. $180,000 of that was earmarked for “global climate change and global climate change outreach.” Exxon has contributed over $1.6 million to CEI since 1998. We want to support organizations that are trying to broaden the debate. … There is this whole issue that no one should question the science of global climate change that is ludicrous. That’s the kind of dark-ages thinking that gets you in a lot of trouble. For the oil industry, Al Gore’s film exposing the truth is perceived as a threat, and they have no shortage of funds to try to distort it. 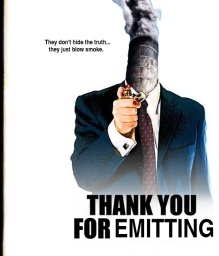 RealClimate's paraphrased take on the CEI's utopian dystopia - "Thank you for emitting". A recent movie, 'Thank You for Smoking', amusingly highlighted the lengths that PR reps for the tobacco companies would go to distort the public discourse on the health effects of smoking. Lest you thought that was of merely historical relevance, we would like to draw your attention to two of the funniest videos around. Lifting a page straight out of the Nick Naylor playbook, the CEI (an industry-funded lobby group) has launched a new ad campaign that is supposed to counteract all those pesky scientific facts about global warming. The first ad (both available here) deserves to become a classic of the genre. It contains the immortal lines 'CO2: they call it pollution, we call it Life!' - it is beyond parody and without content - and so you should definitely see it. The second ad has a little more substance - but is as misleading as you might expect. 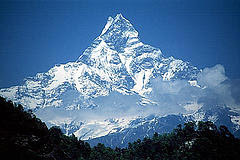 They only discuss one scientific point which relates to whether 'glaciers are melting'. Unsurprisingly, they don't discuss the dramatic evidence of tropical glacier melting, the almost worldwide retreat of other mountain glaciers, the rapid acceleration of fringing glaciers on Greenland or the Antarctic peninsula. Neither do they mention that the preliminary gravity measurements imply that both Antarctica and Greenland appear to be net contributors to sea level rise. No. The only studies that they highlight are ones which demonstrate that in the interior of the ice shelves, there is actually some accumulation of snow (which clearly balances some of the fringing loss). These studies actually confirm climate model predictions that as the poles warm, water vapour there will increase and so, in general, will precipitation. In the extreme environments of the central ice sheets, it will not get warm enough to rain and so snowfall and accumulation are expected to increase. TreeHugger can see the bright side of these ads - as a parody they can't really be beaten - one day in the hot, grim future we'll be able to look back at these things as a propaganda classic - a sign of just how stupid and dysfunctional culture-war America had become. Their title - "CO2: We Call it Life" ads: We Call it Hysterical". After reading John's post on The Exxon-funded CEI's commercials we thought we would look at them to see if they could be parodied, but they cannot, they are already parodies. It is as if they hired Jon Stewart to put them together; they are truly the funniest thing we have seen in weeks. Our message to Al: be afraid, very afraid. Almost unbelievably, Grist has failed to hail this dramatic cinematographic achievement - which leaves me feeling somewhat let down - maybe they are still trying to come up with a title worthy of the topic. Grist has noted the "information" dissemination activities of the CEI before though. From "The Snow Must Go On". When Sheila Watt-Cloutier was growing up in Kuujjuaq, an Inuit village in far northern Quebec, summer days never got hot enough for shorts and T-shirts. Only the very brave ventured into the frigid local river for a swim. But now, she says, there are many warm days, and "the whole community goes down and spends days beaching it and trying to cool themselves off." Needless to say, a day at the beach is not a normal Arctic activity. The climate shifts responsible for that change are also melting ice sheets, eroding the region's coastlines, and shrinking habitat for polar bears, caribou, and other animals the Inuit have long relied on for sustenance. While other citizens of the world debate the very existence of climate change, the Arctic is melting -- and the mainstays of this indigenous northern culture are disappearing with it. Watt-Cloutier refuses to stand by while that happens. The 51-year-old is the elected chair of the Inuit Circumpolar Conference, a federation of Native nations representing about 150,000 people in Canada, Greenland, Russia, and the U.S. To save their homes, their prey, and themselves, the ICC is taking on the world's largest, most recalcitrant greenhouse-gas emitter, the country the Inuit say is driving them extinct: the United States of America. The group is, as Watt-Cloutier puts it, "defending our right to be cold." That request isn't sitting well with some. According to Goldberg, representatives from groups known for disputing global-warming science -- including the Washington, D.C.-based, right-wing think tank the Competitive Enterprise Institute -- showed up at the ICC presentation in Buenos Aires last year, asking pointed and misleading questions. "[They] were not just questioning, but were being very argumentative," he says. The ICC also found some of its posters and fliers around the conference grounds ripped down, or slashed through with red arrows pointing at a flier denouncing the Arctic Climate Impact Assessment as "junk science." Mikki Krimmel points to a Mother Jones article from last year on Exxon's support for 'research" into global warming - with the CEI number 17 in a list of 45 institutions (almost entirely "think tanks") that receive funding. Moving onto other topics, the Australian takes a look at "Peak Labour" - using peak oil theory as a guide to the effect on the aging population (in the West) will have on the supply of labour. Just as the notion of peak oil is thought to have an impact on the underlying price of West Texas Crude, I suggest there might also be an Australian concept known as "peak labour". This refers to that notion that there is a point in time when the rate of growth in the labour force reaches a plateau and then reduces. And if this is so, then just as is thought to apply in peak oil, the underlying price of labour rises. In order to test this theory it is necessary to access data relating to a 100-year slice of Australian history between 1950 and 2050. There are no projections of the labour force on an annual basis to 2050. And so for this reason I have assembled one century's data on the population pool from which the labour force is drawn. The Australian population will stand at 20.3 million in June 2006. This includes 13.7 million aged between 15 and 64. The labour force at this time will comprise 10.6 million including about 543,000 unemployed. The labour force is largely but not exclusively carved from the 15-64 age group and now represents about 77 per cent of the available population. This 100-year perspective of growth in the working-age population is instructive for several reasons. It indicates that without incentives to increase the rate of labour force participation the underlying demographic bedrock shows contracting growth rates in this decade and the next. This has implications for Australian business. In the 1960s phase of growth the power balance between worker and employer rested with the employer. If you do not accept my terms and conditions then I will choose someone else. In the ramp-down phase in this decade and next the power balance shifts from the employer to the worker because there is not the same depth in the labour pool to select an alternative candidate. Baby boomers entered the workforce in an era of competition for jobs. Generation Y is entering the workforce in an era of competition for workers. In the former era employers could ignore people issues; in the latter era employers must be more focused on recruiting and especially retaining young staff. There might also be a case next decade for employers to refocus from Gen Y to boomer retention issues. In either case this issue of labour, and especially of skilled labour, will remain on the business agenda for decades now that we seem to have passed the point of "peak labour". AlterNet has an interview with James Howard Kunstler, who is sounding much less doomerish than usual. James Kunstler: Well, it's only pessimistic if you think that living in Plano, Texas, is the world's greatest thing, you know? BA: Well -- okay, that's a fair point -- I guess some of us would say that if Las Vegas really becomes a ghost town as you predict, that would be a good thing. JK: That would be good for us in many ways -- not least of which is because Las Vegas is the holy shrine of a very pernicious religion -- which is the religion of getting something for nothing; the religion of unearned riches -- which is an idea that is extremely destructive and insidious and has now spread throughout our culture and has given people the idea that earnest efforts are not required to have good outcomes. BA: Nonetheless, you lay out a vision that is very stark and extreme in what is going to happen to vast swaths of the country -- the South; the Southwest in particular. How do you respond to people who say the laws of supply and demand will dictate that as oil prices go up, the market will move to new kinds of energy and that some market correction will make these circumstances much less dire than you predict? JK: Well, I wouldn't try to denounce them or anything. There's no question that as a society we are going to be doing some things differently, including some things that will surprise us. And not all of them will be terrible. Some of them will be beneficial. But I think on the whole, that there's a great deal of wishful thinking involved in believing that both the "market" and "technology" will bring some rescue remedy to stave off the discontinuities that we face. BA: Tell us about your seminal work The Geography of Nowhere, in which you laid out the history of suburban sprawl and its negative effects on the American economy, culture, and landscape. What compelled you to tackle this subject? JK: I was a young newspaper reporter during the OPEC oil embargo of 1973, and I was working in this brand new building out on this heroic suburban boulevard of commerce -- filled with the big box stores, and all the new malls, and the muffler shops, and all the other accessories of the world's highest standard of living. And so we went through this energy crisis, and it made quite an impression on me. Especially how dysfunctional our suburban living arrangements could become if anything went wrong. And so, I went on to do other things: I worked for Rolling Stone magazine and then I quit that, and kind of retreated to upstate New York to write novels. And after a while, I got back into journalism, focused on our living arrangements in America and land development. Well, we're basically destroying our country and also probably destroying our economy and our future by developing this economy based on the never-ending construction of more and more suburban sprawl. And so I wanted to explore exactly what the nature of this problem was as well as its most visible manifestations -- you know, the endless vistas of nauseating crap that we've smeared all over the landscape. The Energy Blog has an update on GreenFuel's biodiesel from algae research. There are several unanswered questions about this technology, the two main ones being whether the technology is really economically scalable to serve a full sized power plant and whether the method of harvesting the algae is reliable enough for a commercial facility. I don't know whether these questions have been answered in previous tests or will be answered in this test, given the limited time frame of the test. A white paper which I recently noticed on their website gives a good explanation of their process and philosophy. My original post on their technology gives more details about their technology than they currently have on their website, although I can't be sure they are still using this exact configuration. The company has always defended their position that plenty of land is available for their plants. Tyler of Clean Break had a fairly recent article in the Toronto Star giving some details about this argument. Jim also has a post on zero energy homes. As the cost of solar PV systems declines and PV production increases 30% a year, “the market penetration of these highly-efficient homes has already begun and will continue in selected markets,” the study notes. ZEH will get a further push from low-cost solar thermal water heating designs under development now, complementing the portfolio of energy-efficiency improvements in appliances, building envelopes, windows and mechanical systems that is also moving into the market. Zero energy homes are connected to the grid, and combine energy-efficient design and technology with solar electric and thermal systems to produce as much energy as they use on an annual basis, resulting in net zero energy consumption. The first ZEH in the U.S. was built in Arizona in 2003. I'm not sure that I agree future energy sources have to have a greater EROEI than current ones - after a lot of thinking about it I tend to believe that there are sufficient gains that can be made from conservation and efficiency to balance out lower per capita energy availability - and a sustainable economy based largely on renewable energy is possible (albeit substantially different from the present mode of operation). So I don't assume collapse will occur (which doesn't mean it won't - just that it doesn't have to happen - my usual rude observations about various political and corporate figures can be inserted here as a caveat). It's reassuring to know that Australian democracy is still in the right hands. Take, for example, the issue of prime ministerial succession planning. Under our system it works like this: the incumbent clings to power ... a usurper stakes his claim ... the media convenes a frenzy ... then it's over to Rupert (and, until recently, Kerry) for final endorsement. Yesterday it was over to Rupert, who used the opportunity of a White House presidential dinner to advise that because John Howard was "on top of his form" it was "much better to go out that way, than like Margaret Thatcher, or losing an election". This confirmation of the baton change in Australian leadership was welcomed by the PM-in-waiting Peter Costello, who was restrained yesterday in his descriptions of the kingmaker of Australian politics: "He is an extraordinarily intelligent person and I always listen very carefully" ... "he is possibly the world's biggest media baron ever" ... "he's someone who's been a very successful Australian" ... "he's a proud Australian and I pay tribute to him because of that" ... "I don't think he's ever forgotten his Australian roots". Just two small matters remain before the baton is passed. First, public or private endorsement for Costello's ascension from James Packer. Then a little tweak to the country's media laws to add a bit more bulk to the empires and ensure the circle of power sharing is completed. It's reassuring to know that Australian democracy is still in the right hands. 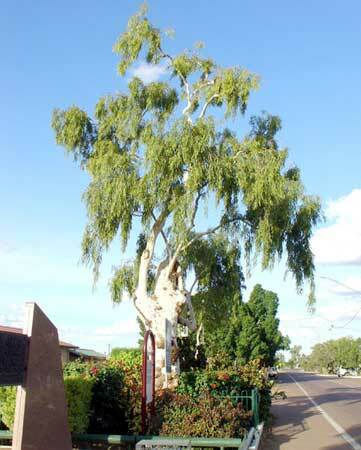 The historic Tree of Knowledge in the central western Queensland town of Barcaldine has been poisoned. The ghost gum is symbolic of the Australian Labor Party, which was founded in the town. Barcaldine Mayor Rob Chandler says it appears someone has poured about 30 litres of chemicals over the tree's roots. A tree doctor is assessing the damage and Mr Chandler says the community is very upset. "The Tree of Knowledge is just part of our history, it's part of Australia's history," he said. "It's from those meetings under that tree that the Australian Labor Party was formed back in 1891 and it's a very, very important part of Queensland and Australia's history."